Contains no preservatives, animal extracts or artificial colouring. 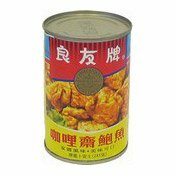 Ingredients: Gluten (Wheat Flour Protein), Water, Curry Spices, Soybean Oil, Sugar, Salt. Simply enter your details below and we will send you an e-mail when “Curry Cha'i Pow Yu (Braised Gluten) (良友牌咖哩齋鮑魚)” is back in stock!